When you say that your mount is "unguided", do you mean no autoguider or that the mount doesn't track the stars at all? Given the exposure time, I'm guessing the latter but I just wanted to make sure. Edited by Clete, 23 January 2019 - 03:52 PM. You are correct—I meant "no autoguider", just sidereal track. At the time, I only had the Skywatcher two-axis motor kit installed that had no autoguider port. I've since upgraded to the GoTo motor kit. One question - does the autofocus work or did you just set the focus at infinity or what? I love this. 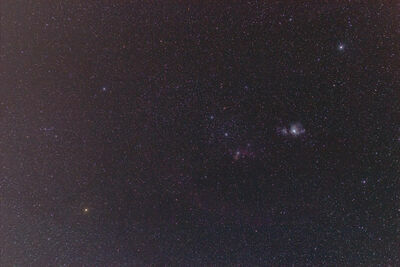 There is actually quite a lot of nebulosity visible in the shot. 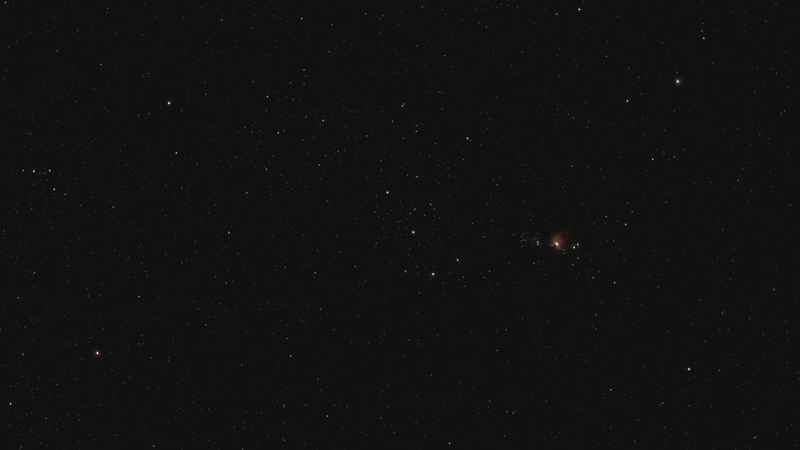 I don't have a Bahtinov for the 50mm, so I do manual focus on a bright star with Live View at 10x zoom. I stop down (~f/4 or so) and hold down the f-stop simulator button on the body while trying to bring star to a point. The focus point is when the thin fringe around the star changes from green to magenta (or disappears). I tried it last night and found that I couldn't get it to focus very well at all until I figured out to stop it down. F/4 was the magic number. I didn't get a lot of subs because it took forever to figure out the focus and because my session was cut short by dew starting to form on the camera lens (not to mention the Gibbous Moon coming up). I got several 30 sec shots though so I'll stack those up and see what it looks like. I also played around with the exposure time and found that I could get 120 sec shots with next to zero star trailing so I took some of those as well. If the stacked images look promising, which I'm betting they will, maybe I'll do another night's worth of data collecting. Even with the focus fighting me like a wet cat, I still enjoyed the heck out of doing it. That was the first time I had ever thought that my 50mm lens was worth a nickel. Thanks for a great idea! No worries, mate! I look forward to your output. Wide open (f/1.8), my 50 struggles with coma at the center and strange star shapes at the corners. But stopped down to f/2.8, the coma is gone and the corners are passable. The field size makes it pretty unique—it's produced my best shot of the full extent of the LMC to date. I'm so envious of the stuff you guys can see down south. I've never seen the LMC with my own eyes before. Maybe I'll get to go way south on vacation one of these days. That's another cool shot, by the way. I wonder what this 50mm lens would do with the Andromeda Galaxy? I sort of rushed the stacking and processing job. I stacked every 30s sub I took, meaning I didn't weed out the bad ones. This is 84 30s subs at ISO 1600, stacked with 10 darks and 14 flats. The light pollution was truly horrendous and I'm not sure but I think I may have messed up the flat frames which left a terrible glow 3/4 of the way around the outside of the image. I got a lot of it subtracted out and I cropped out what I could of the rest but there is still that bright area on the right side of the image that I can't get rid of. I used Photoshop CS2 with no astronomy specific tools. Edited by Clete, 24 January 2019 - 08:04 PM. Pretty clean stars corner to corner. The histogram needs a little stretch, though. 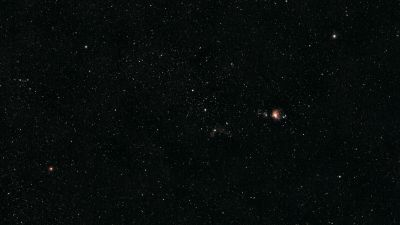 Using the Curves function (believe this is in CS2), I could bring out quite a bit of detail in the Horsehead, Flame, and Orion Nebulas; just had to reduce the saturation or the reds were overdriven. Unfortunately, the 8-bit JPEG significantly limits the histogram expansion. 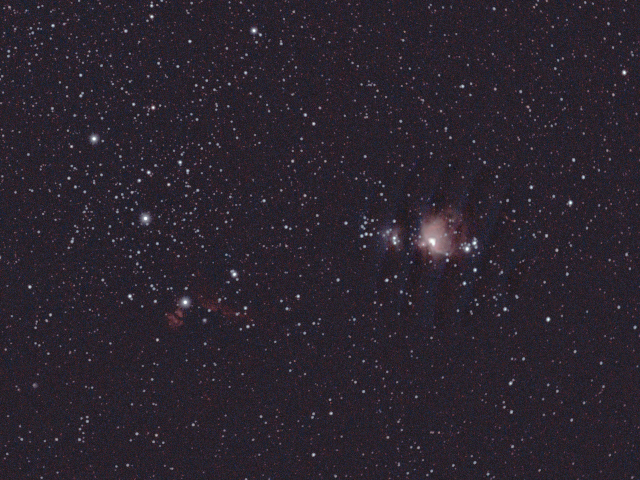 There was also some sort of pattern around the Orion Nebula…did you have some sort of filter on the lens? A 50mm gives you 25˚ FOV on an APS-C sensor. The Andromeda Galaxy wouldn't take up much of the field, but enough to be interesting IMO. It's below the horizon for me now (and only 25˚ above the horizon at best), so I couldn't say. No, no filter. I caused that weirdness with my rushed processing job trying to substract out the super crazy light polution that was causing a terrible gradiant across the image. I've figured out that I did something wrong with the light frames (I don't know what) and its cleaner when stacked without them. I'm reading up on how to process this image better and will try again when time allows. I'd love to get you the original file straight out of DSS. I'd be interested to see what someone who knows what the heck they're doing can pull out of it. Edited by Clete, 25 January 2019 - 12:31 PM. I typically do two or three passes to find the right contrast curve; I'll then use Color Balance to improve the color quality. 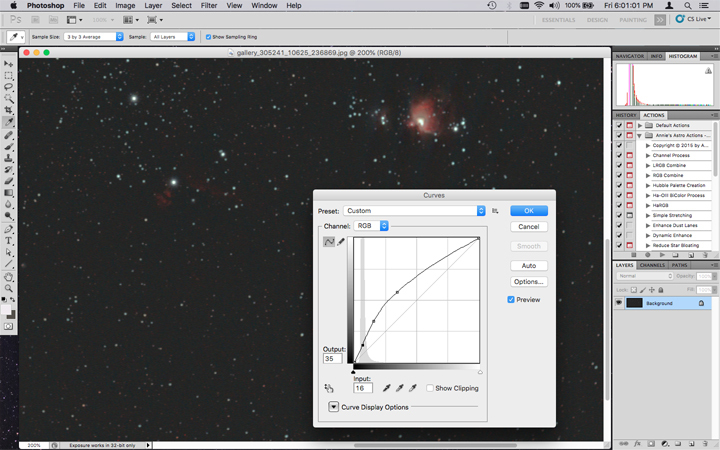 The exotic methods and actions help with finer detail, noise reduction, and star sizing. What do you mean by "two or three passes"? Does that mean you make the same (or similar) curves adjustment two or three seperate times? Exactly as you state. Similar curve adjustments but in smaller increments with each pass. As I approach my final image, I'm pretty much on the straight line. I keep messing around with this image. I discovered a program called Regime that took care of the gradient really well but I think at the expense of Barnard's Loop. I'm still not really happy with this one, it feels over stretched. But, its better than before. At least you can see the Flame & Horse Head Nebulae. Every time I process it, it comes out a little different so maybe I'll keep playing with it. I can't wait till I have another clear night so I can get some better data to work with! Edited by Clete, 27 January 2019 - 01:13 PM. You've got 42 minutes of data, so you should have enough to pull out a bit more detail already (I only had 2 minutes). You might try longer exposures/higher ISOs to boost Barnard's Loop; you might also might try much shorter exposures to bring out Trapezium. Keep messing around…it's how we learn!